Today was day zero of the Iditarod, the Ceremonial start of the 1,000-mile sled dog race from Anchorage to Nome in Alaska. Today each of the sixty-nine mushers start with only twelve dogs in their teams, down from the sixteen they'll use in the "real" race, and they ride twelve miles through downtown Anchorage in a little parade, two minutes apart. Each of the mushers towed a sled with a passenger, an "IditaRider", who has a one-in-a-lifetime chance to be part of the race. 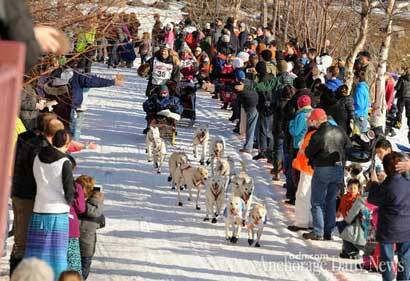 Tomorrow the real race starts with the "restart" in Willow, on the North side of Anchorage. 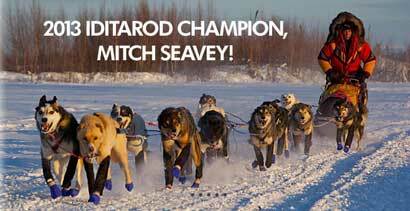 If you're planning to follow the race, there is of course the Iditarod offical website, which has up to the minute standings, and the Anchorage Daily News, which has great coverage including an Iditablog. There is as always speculation about the favorites; a lot of people are picking Norwegian Robert Sorlie, a two time winner who is back this year after a four year absence, or Aliy Zirkle, who's finished second twice including last year. (There are three Norwegian teams this year, all strong contenders, and a fair number of women are competing, including of course my favorite DeeDee Jonrowe, who has finished second twice.) Other favorites include Mitch Seavey, last year's winner (and oldest ever), and his son Dallas Seavey, 2012 campion (and youngest ever). Dallas' brother Dan is also in the race this year. 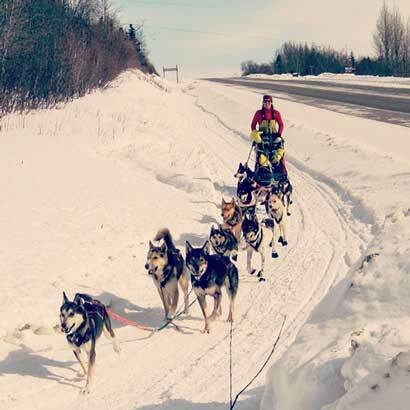 One thing to be aware of is that in the early days of this eight-day race the fastest teams may be going the slowest; "go slow to arrive fast" is an Iditarod truism. The best way to see which teams are going to win is to watch the dogs eat, and if you can't do that you have to scan the blogs and Twitter. Onward to the restart, and Go Deedee!